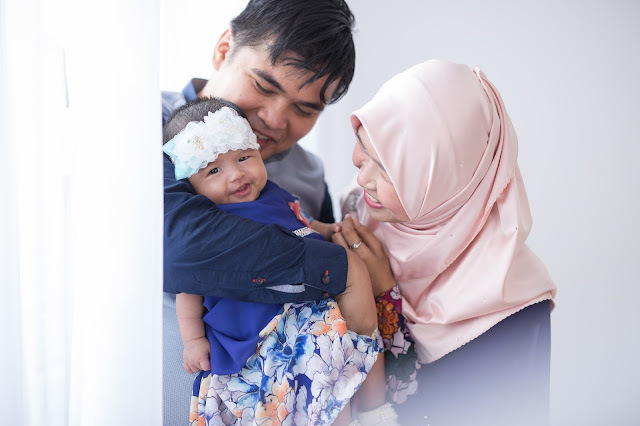 This time I would like to share with you on how me and my husband did our very first Aqiqah of baby YK and house warming (since we just moved to our new house this early year). Basically, planning an event is not an easy task (for me, personally ever since my college years haha). But, what is more difficult is that planning an event to represent your family while you're on confinement. Yes. CONFINEMENT. Without any help from others. Our small family of 3 managed to organised the event for 200+ of friends and neighbours. Husband agreed on providing the fund (well of course kan? HAHA) while me, I have to find the right caterer and the 'pelamin' so-called decorator. Okay, we didn't just do the Aqiqah, we had the "Cukur Jambul" and "Marhaban" too. **Just a lil bit information about few words that some of you might come across while reading this through. While "Marhaban" is actually comes from the arab word that brings the meaning of welcoming. And Marhaban in Malay culture is a group of people (usually from motherly figured/aged reciting some prayers to thank to Allah (God) for the baby). Now, let's proceed with my preparation of our very first event of #babyYK or known as Maysaa Yuka Mohd Yusairy on 12th November 2017. 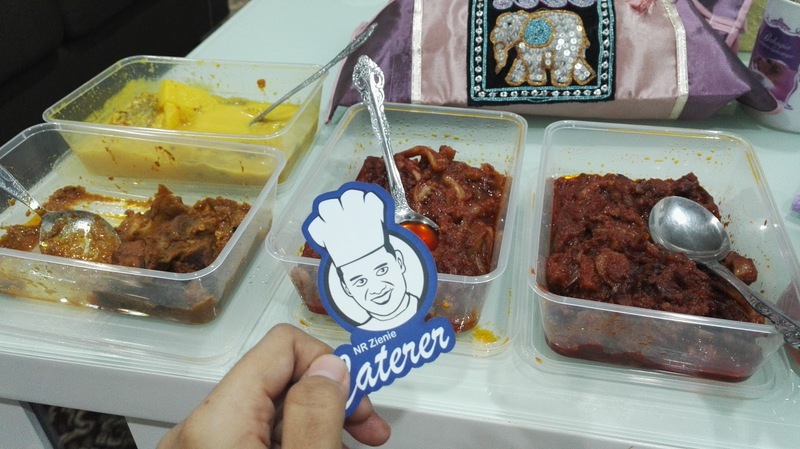 So, our preferred caterer came with 2 types of Sambal Sotong. Sambal Sotong Kering and Sambal Sotong Basah. I love all from the beginning though I cannot taste it at that time. From just watching them presenting their food to us. Is another additional point for us to choose them. NR Zienie Caterer is a husband & wife business and the husband himself is the chef. He is a real chef. With a background as one of the chef in Concorde Hotel. Hahaha. You read it right, a Chef Hotel he is! And guess what made his food special? He made his own paste of his own food. No wonder his Kambing Kuzi is a top notch for us. Yum yum. Sangatlah yummy sampai tengah type ni boleh terbayang terliur masak Kuzi dia. They both stay in Lembah Klang and as a home cook caterer, he is willing to go for as far as Shah Alam to serve his best to his customers. I'm telling you, our guests even stayed until the end of our event just to repeat his Kambing Kuzi 2 3 times okay! Sampai risau dah tuan rumah takut kambing tak cukup katanya, Hahaha. So, this is the Marhaban group before the event started. After the Marhaban finished, then we started the Cukur Jambul started with the Marhaban group members, family and friends. To those who are still new in this like me, let me explain what normally people will do in this kind of ceremony. 1st, you will need to feed the baby with the holy water of Air Zam Zam. At the end of the event, my husband asked the Marhaban group to sing a song that he has been wanting to hear it ever since his mother still alive. Paras Gemilang is the song that he hoped that his mother would sing during our wedding reception, but it didn't happened as for some reasons. The song was made by the Marhaban group members dedicated to their children/baby. Tidur tak lena Makan tak kenyang"
It was his wish to have her late mother together witness this day, but Allah loves her more. A group photo with Marhaban Group from Taman Impian Ehsan, Balakong. A photo with my parents and my uncle from Ampangan, Seremban. One more with my susah nak jumpa kawan yang dah hampir setahun tak jumpa walaupun duduk sebelah taman je kannn. One with my high school friend, eh anak orang hujung tu comelnyaaa. Ya. Ramai cakap pelamin cantik sangat macam pelamin kahwin kan? Maysaa Yuka Pelamin Berendoi was perfectly done by Zoura Pretty Fingers. Okay, I know everyone is looking forward with people that have helped us in making this event a success (for me haha). Thus, please scroll below for more info's. To sponsors, a very big thank you from the bottom of our little family. Without the pelamin, without our photographer, our good food from our best caterer, without the canopy to shiel our guest from the sun hot and rainy weather, desserts to sweeten our guests day, marhaban group to complete our event, without all of these above this event wouldn't go well as how we planned. Durians for Anniversary. You think?